There are some places which I'm happy to visit again, and PORTA is one of them. From the outside, nothing seems to have changed much. Its lovely premises remains as lovely as my previous visit two years back, but the all-day dining restaurant at the lobby of Park Hotel Clarke Quay has since gotten Executive Chef Alex Phan onboard to helm its kitchen. Chef Alex's rejuvenated menu is said to present a wider repertoire of well-loved European and Mediterranean dishes, combining fresh produce sourced both globally and locally. 51 SOHO @ Telok Ayer Street ~ All-Day Dining Joint With Asian & Sichuan Influences. Do Try The Interesting Chinese Wine Cocktails! Depending on the hour, the menu at this newly-opened joint at 51 Telok Ayer Street changes to suit different needs, beginning with breakfast options in the morning, one-bowl meals for a convenient lunch, to hearty mains for dinner. Light bites are available as well. While the all-day dining concept is not entirely new, 51 SOHO's interesting offerings and beautiful space does provide refreshed excitability, so it's still worth checking out. IPPUDO Singapore Launches Seasonal Rich Curry Tonkotsu Ramen! So Slurpilicious! Hurry for curry! That what I did when I heard that IPPUDO Singapore has launched its latest seasonal ramen - Rich Curry Tonkotsu Ramen - just a few days ago on 15th March. First thing first, this is not your usual Japanese curry that's typically sweet. The spicy bowl is specially created for the Singapore palate, combining three different types of Japanese curry, and the rich spices of South India (masala, cumin seeds, and cayenne peppers) with IPPUDO's signature tonkotsu broth. Opus Bar & Grill @ Hilton Singapore Celebrates 4th Anniversary With NEW Dishes & FREE Wine! Pay for steak and get a bottle of wine FREE!!! No, you're not reading this wrongly. Unbelievable as it might seem, Opus Bar & Grill at Hilton Singapore is doing exactly that in celebration of its 4th anniversary. The offer is valid for the month of March 2019, and available from Sundays until Thursdays. Opus Bar & Grill is considered to be one of the best steakhouses in Singapore, so it's really a no-brainer that the deal is way too good to be missed. When Kilo Kitchen closed after eight years at Kampong Bugis Road, it doesn't mean goodbye forever. The restaurant simply found a new home at Duxton Road last December, and got closer to its sister property Kilo Lounge which is just a stroll away at Tanjong Pagar Road. Let's eat, drink, and make merry! That's the vibes I felt when I stepped into Kilo Kitchen's gorgeous premises. The floor-to-ceilings windows allowed the space to be bathe in the warm golden tones of the setting sun and made it even more instagrammable. I'm so ready for Kilo's menu of modern comfort food that draws from Latin America and Asian influences. A keto diet has been proven (by some of my friends) to be an effective way to lose weight, but it failed big time on me because... I love pastas too much to give it up. Pasta Supremo ups the temptation factor by offering pasta that are handmade in-house daily, and allowing diners to build their own bowl with a variety of ingredients. It's up to you if you want your pasta bowl to be over-the-top, instagrammable, or simply a creation that suits your taste buds. But it's definitely not a no-carb friendly choice. Their refreshed menu which was recently launched in February took me completely by surprise. Featuring Asian-inspired cuisine and Western classics, what Baba Chews offers now is certainly not the kind of dishes that the Babas and Nyonya has passed down from generations. While I must admit I was a tad disappointed, the feeling quickly disappeared once we started tucking into the delectable spread. Traditional might be good, but a modern take on it can be just as pleasing, if not better. Many countries experience four seasons through the change of weather, but in Singapore, we do it through one of our favourite national hobbies... food! 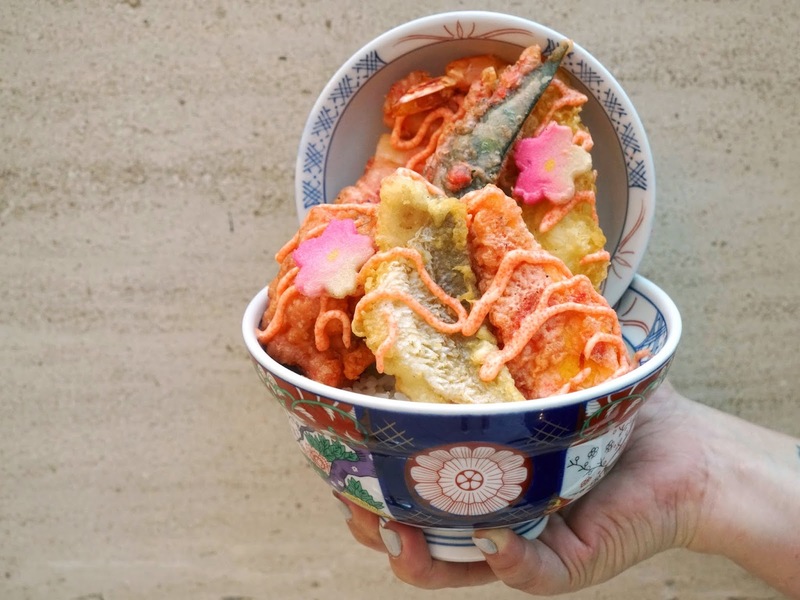 This spring, Tempura Kohaku will be offering their brand-new seasonal delight, Spring Tendon! Showcasing the best of spring harvests in a bowl, the Spring Tendon brims with peak-season produce and spring ingredients including deep-fried tilefish, tamagoyaki, white asparagus, bamboo shoots, pickled sakura leaf, as well as Fu (Japanese wheat gluten) which takes on the shape of a sakura flower. Whenever I'm at the French rotisserie chicken chain Poulet, my standard order is always their amazing roast chicken but this time round, I was lured by its limited-time menu born of a special collaboration with celebrity chef Justin Quek. Chef's Justin is famed for his expertise in French fine dining and deep understanding of Asian cuisines. His Franco-Asian cuisine is represented by his signature dishes such as foie gras xiao long bao, and lobster Hokkein noodles. I was rather excited to see what chef Justin has specially created for Poulet. Happy to say the dishes were super satisfying, and very much worthy of the trip over. It's a tart! It's made with Bak Kwa! It's the "atas" fine dining-style BAK KWA TART!!! You can catch the amazing Bak Kwa makeover on Foodie Makeover 美食大翻新! Hahaha!!! Sorry if I sound too over-zealous here, but it's only because I'm still feeling extremely excited to be involved in this program as the co-host, even though the planning and filming has ended some time ago. The episodes are finally available now for online viewing at Toggle TV. It will be aired soon on Mediacorp Channel U too. Baan Ying, Royal Square @ Novena - The Great Baan Ying Brunch Is Happening Every Weekend! Most of our eyes will light up at the mention of... Buffet! Afterall, who doesn't like an abundance of food by paying just a flat price. Can eat and eat till we get our money's worth haha! For this reason, we gathered one Saturday morning at Baan Ying, where the "The Great Baan Ying Brunch" is happening every weekend from 11am to 3pm. We lost ourselves in an array of popular Thai favourites from the Land of Smiles without leaving Singapore. From Sin Ming to Hillview, CHIJMES, and most recently Zhongshan Park, I've made efforts to visit New Ubin Seafood whenever the family-runned eatery relocates or opens a new outlet. No denying that I'm a fan. There's this homely tze char element in their offerings that's so captivating. Though I must admit our experience last year at the CHIJMES outlet left us feeling underwhelmed for most parts. We blamed it on opening jitters maybe. However, one bad experience doesn't wipe out all the good ones so it didn't deter me from checking out New Ubin at Zhongshan Park. Putting two and two together, FrapasBar is born as the brainchild of the team behind Saveur. We love Saveur for its affordable French fare, and now FrapasBar looks set to continue the group's success by offering diners a combination of French cuisine and tapas-style food paired with a well-furnished bar, all set at wallet-friendly prices. I must say... it's quite a brilliant idea!